In the 1920s and 30s Jack performed as a singer in theatrical productions and on stage with Those Three Fellows (Fred Witt, Reg Hawthorne & Jack O’Hagan) and Joe Watson & His Green Mill Orchestra. He recorded with the Harry Jacobs and Gil Dech Orchestras, Art Chapman’s Rex Orchestra and the American Tom Swift and his jazz band, so it’s quite likely he did a few live performances with them as well. In the 1950s he composed and produced advertising jingles. 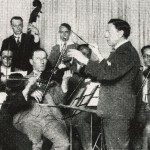 Credit: Jack O’Hagan, accompanied by Harry Jacob’s Palais Orchestra, recording the song Jeannine I Dream of Lilac Time for Broadcast Records, at Broadcast Studios, Bourke Street, Melbourne, November 1928. Jack O'Hagan Collection, State Library of Victoria. 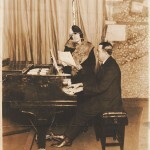 Credit: Jack performs That Old Bush Shanty of Mine with English actress Victoria Carman, c. 1930. Jack O'Hagan Collection, State Library of Victoria. 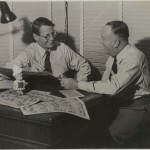 Credit: Jim Bancks, creator of comic strip ‘Ginger Meggs’, and Jack O’Hagan discuss Jack’s character song of the same name, 1948.
Credit: Singing commercial recording session c. 1950’s. 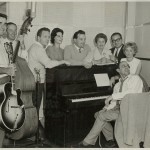 Left to right – Jack Westmore, Don Moore, Vic West (or Joe Hudson), Terry King (or Dorothy Baker), Bob Horsfall, Judy Wright, unknown man, Elaine McKenna, Ron Rosenberg at piano and standing far right, Jack O’Hagan. Arts Centre Melbourne, Performing Arts Collection.